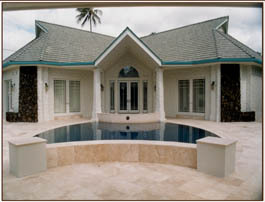 KAHALA KAMAAINA HALE - The form of this stately residence is drawn from several symbols of kamaaina culture in early 20th century Honolulu. The Pacific Club and the Honolulu Academy of Arts are two well-known and influential expressions of a local architectural style originally borrowed from early California structures and merged with traditional Asian elements. The Arts and Crafts movement in art and architecture popularized during the same period is also expressed in the details of this home. Windows, lighting, and decorative metal gate design all feature Arts and Crafts design, while the bumpy stucco exterior finish on house and walls is inherited from plaster over rough stone as in the Mission House and Kawalahas Church. 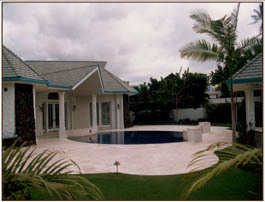 The roof line echoes the Hawaiian "long house" of the kings. Of particular note is the "horizon edge" swimming pool which is level with the deck. 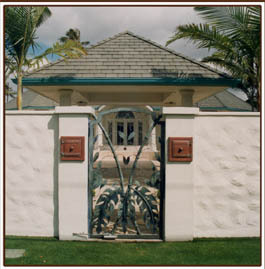 Also of note are the custom metal gates designed to incorporate Hawaiian foliage.